Sarah Palin hit Oprah with a power suit perfectly designed to project coyness. Vanessa Friedman reports on Palin’s tactical style choices. Plus, view our gallery of Palin’s fashion. And so, thanks to Oprah, we come to stage three in the sartorial evolution of Sarah “I really was a contenda” Palin. After anorak-wearing hockey Mom and Akris Punto-wearing vice-presidential candidate: aqua-wearing auto-biographer. • Conor Friedersdorf: Palin’s Fatal 2012 Flaw • Lloyd Grove: The All-New Sarah Palin If ever an outfit played it coy about future plans, this is it. It neither commits to a future presidential run—if that was the message, odds-are Mrs. Palin would have eschewed the exaggerated Peter Pan collar and costume jewelry baubles in favor of a power suit like those that appeared on the campaign trail, ideally in a more brick-like, building-bloc shade—nor does it demonstrate an intention to grand jeté into the private sector in order to leverage her best-seller status into yet more lucrative corporate adventures. That would have necessitated a similar leap into the dressing rooms of Armani, or perhaps Donna Karan. • Watch the 7 Best Moments of Palin’s Oprah Interview • More Daily Beast contributors on Palin’s book tour. The lack of an obvious brand label, however, is a tactical carrot for Mrs. Palin’s maybe-possible-power base, as it sets her diametrically apart from Michelle Obama, who has made a bit of a crusade out of consciously supporting niche, “intellectual” and/or “conceptual” designers, and promises…ooh, a little something that might have to do with action in the future. Compared to the current first lady’s idiosyncratic and political clothing choices, Mrs. Palin’s talk show trifecta of bright jacket/black dress/black heels looks oh-so Real Woman (albeit it Real Woman with a newly pumped-up fall of hot mama hair), and telegraphs an aura of winking coyness. The shoes, after all, that she wore when she met Barbara Walters are lace-ups mid-height heels—awfully practical—but the heels themselves are stilettos. Put another way, her mouth may be saying no to Palin for President in 2012, but her clothes are saying…maybe. 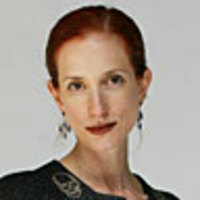 Vanessa Friedman has been fashion editor of the Financial Times since 2002. She writes a weekly column on style, edits the Business of Fashion supplements, and helped coordinate the FT’s Business of Luxury conference. Prior to joining the FT, she was the features/fashion features director for the launch of UK In Style, and contributed regularly to The Economist, The New Yorker, Vogue, and Entertainment Weekly.